The festive season has begun in India. Navratri is here and its time for some special festival sweets. The first day of Navaratri has Sweet Pongal as an offering to Goddess Durga. 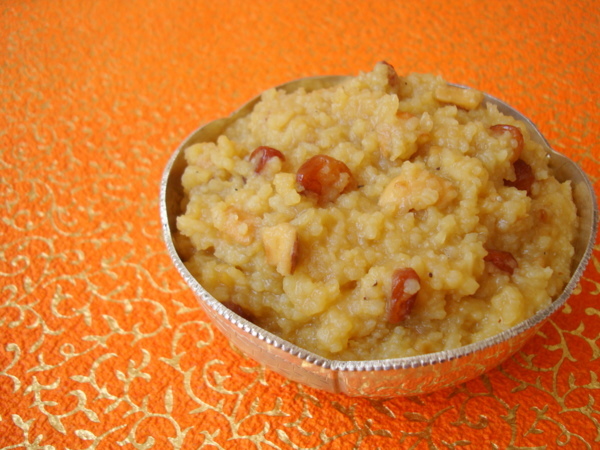 Sweet Pongal is the easiest to make of all the festival recipes. Creamy, infused with cardamom, garnished with roasted raisins and cashew nuts, this delicious jaggery based pudding comforts and warms the soul. You can use sugar instead of jaggery but the flavor of sweet pongal is best when sweetened with iron rich jaggery. 1 Heat a pan, add 1/2 tbsp of ghee and toast the cashewnuts and raisins till golden brown. Remove from pan, keep aside. In the same pan, add the moong dal and roast till its lightly red. Remove. 2 Heat a vessel, add grated jaggery. Let the jaggery melt over slow flame till its sticky on touch. Don’t over cook it, it should basically completely melt. Strain the jaggery and cool. 3 In a separate vessel, bring water to a boil. Lower heat, add the rice and washed moong dal to the water. Cook till the rice is soft and the mixture turns thick. 4 Reduce flame to low, add the jaggery syrup to the cooked rice and dal mixture and mix. Add the cardamom pwd, salt and toasted cashews and raisins. Let it cook for 2-3 mts and turn off flame. 5Serve warm or bring to room temperature and refrigerate until chilled. It tastes good both warm and chilled. Kitchen Tips – Add the jaggery syrup only after the rice is completely cooked. Ensure the flame is very low when adding the jaggery syrup. You can substitute jaggery with granulated sugar. Optional – Toast finely chopped fresh coconut in little ghee and add along with cashew nuts and raisins. You have a lovely blog.it would be great if you could do a couple of posts on kitchen aids – your kitchen appliances such as mixie,wet grinder,cutters,ladles,muruku press, sweet press,cookers,steel utensils,special tawas and pans etc and indian pantry section – toor dal, rice, other ingredients.These posts would be of great to newly weds in setting an indian kitchen especially for those away from home. You have an amazing site. I love all your recipes as well as your photography. A super like to my all time favorite dessert. Thanks for stopping by my blog! I just wanted to say that I think you have an incredible blog, and I can’t wait to try some of your recipes!! mouth watering recipe.cant resist to make and eat it. 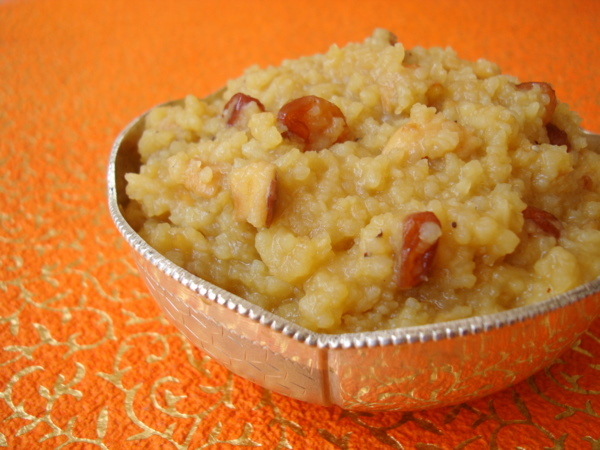 Delicious and irresistible sweet pongal.. I tried many of ur receipes and tasted good. In this receipe we need to wash and fry the moong dal or after frying we should wash.
which type of rice should we use? par boiled/basmati/tuta basmat/ other? Very nice recipes , visit my site too to see so many Navratri recipes.